St. Moritz, 29 January 2017. 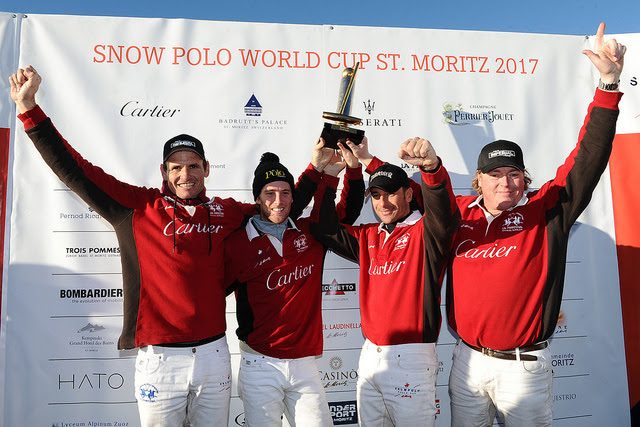 Rommy Gianni's Team Cartier won the Snow Polo World Cup 2017. In the Final, they beat Melissa Ganzi and her Team Badrutt’s Palace Hotel with 7-4. In the final of the runnners-up, Team Perrier-Jouët took its first victory - beating James Beh's Team Maserati with 4-5. 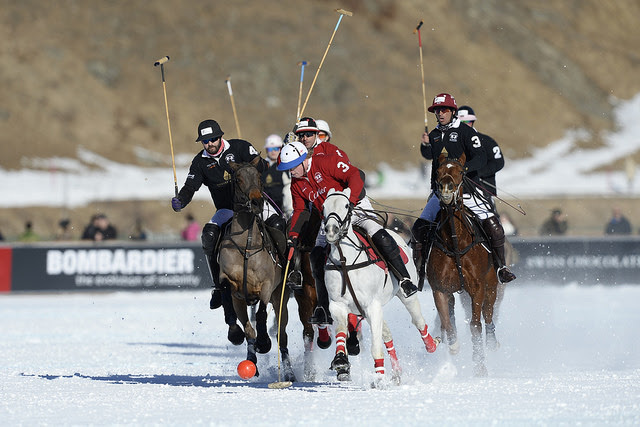 The 15,000 guests who had gathered over the three days have been entertained by some outstanding polo, whilst off the frozen lake, guests have enjoyed, fun, laughter and outstanding Swiss hospitality. 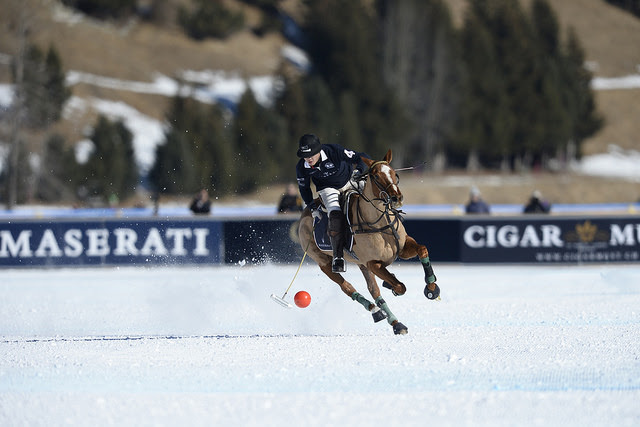 Sunday 29 January was a culmination of three days celebrating the best snow polo in the world. The sun shone on the righteous and the organiser of this event, Reto Gaudenzi ‘The Godfather of Snow Polo’ has clearly pleased a higher being as the glorious weather continued for the Finals on Sunday, meaning that the playing surface was pure perfection, allowing fast and thrilling polo to delight the 7,000 spectators. The grandstands were packed as fur clad spectators sipped Perrier-Jouët, cheering on their favourite teams and enjoying the fun-filled atmosphere as Maserati cars chauffeured VIP guests and players to the frozen lake. Saturday night had been a very special evening as the great and the good of St. Moritz enjoyed a sumptuous gala dinner at Badrutt’s Palace Hotel. Guests were entertained by a special Azeri display of dancing and music. Azerbaijan hosts The Polo World Cup in September and the ‘City of Fire’ is known for its friendly people and great hospitality. Guests also enjoyed a catwalk show with models elegantly showcasing the truly breath-taking Magicien Collection from Cartier, with those not playing the next day dancing the night away in the King’s Club. The first match of the day was between Team Perrier-Jouët and Team Maserati for The La Martina Cup. In a close scoring match it was ultimately Team Perrier-Jouët who secured the title with a final score of 4-5. Post-match, Fabio Meier, conceded the match was as tough as the score suggested, «Maserati played well, they played aggressively and didn’t make it an easy game for us, so that’s why I am unbelievably happy that we won. As a team, I think we played well over the three days». As the sun continued to bathe the Engadin Valley in glory, The Cartier Trophy, the stunning trophy for the ultimate winners of the tournament was won by Team Cartier themselves after a Final which saw them pitted against Team Badrutt’s Palace Hotel. The match was an epic Final which reflected the fierce three-day competition, and with special permission from Engadin Airport, was filmed by a drone for the first time. The first chukka saw no score as the teams matched each other equally in defence and attack, but it was a different story in the second chukka which saw Cartier assert their dominance with three goals from Chris Hyde and Dario Musso and only one in reply from Alejandro Novillo Astrada for Badrutt’s Palace Hotel. The goal scoring genie was well and truly unleashed and determined not to be the underdogs for long, Team Badrutt’s Palace came back fighting after half-time and quickly found the goalmouth twice in quick succession, to equalise the scores at three all. But Charlie Wooldridge for Cartier secured his name on the scorecard and at the end of the third chukka, Cartier once again took the lead. It was all to play for in the in the last chukka of play and it was at this crucial point that the firepower of Team Cartier was unleashed with three goals in quick succession. Alejandro Novillo Astrada scored for Badrutt’s Palace, but it was too little too late and as the final whistle blew, a decisive score of 7-4 in Cartier’s favour was the result. On Saturday, Team Badrutt’s Palace had locked horns with Team Perrier-Jouët, who having lost to the tournament favourites, Cartier, most certainly had something to prove. Once again, Team Badrutt’s Palace led the scores from the outset, and this early lead combined with many near misses from Team Perrier-Jouët finally culminated in a 6-2 victory for Team Badrutt’s Palace Hotel and a place in the Final. The next match of the day between Team Cartier, featuring 2016 winners Rommy Gianni and Dario Musso, defeated Team Maserati to win The Deutsche Bank Wealth Management Challenge and secure their place in the Final. The polo bonanza had kicked off on Friday 27 January with the first two qualifying matches basked in bright sunshine seeing fantastic playing conditions which Team Cartier player Chris ‘The Prof’ Hyde described as «The best it has been and playing really fast». 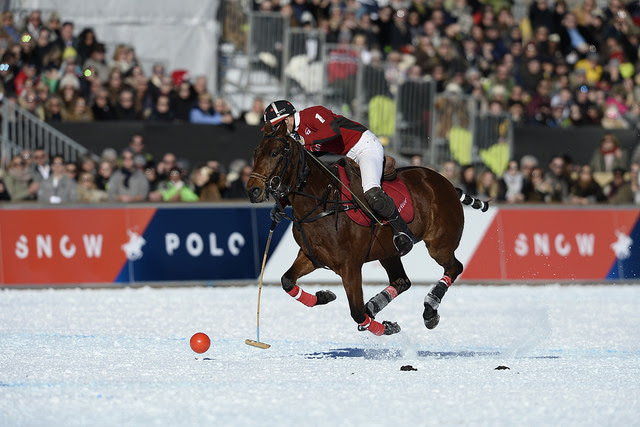 The first match of the event saw last year’s runners-up, Team Cartier, take on Team Perrier-Jouët in a match which saw Team Cartier return to their previous style, as they characteristically led and sealed the deal with a 7-4 victory. Next-up, it was the turn of the Beh family, playing as Team Maserati, who took on the formidable Team Badrutt’s Palace Hotel who true to form dominated from the start, with the dynamic duo of Alejandro Novillo Astrada and Jesse Bray navigating Team Badrutt’s Palace Hotel to a confident final score of 7-1. St. Moritz, 29. Januar 2017. Das Team Cartier des Italieners Rommy Gianni gewinnt den Snow Polo World Cup St. Moritz 2017. Im Finalspiel unterliegt das Team Badrutt's Palace Hotel der Amerikanerin Melissa Ganzi mit dem Schweizer Tito Gaudenzi mit 7:4. Im kleinen Final sicherten sich die Schweizer Gebrüder Fabio und Luca Meier mit ihrem Team Perrier-Jouët gegen das malaysische Team Maserati mit 4:5 knapp ihren einzigen Sieg. Rund 15'000 Zuschauer über drei Tage bedeuten einen Rekord. Zum Abschluss des dreitätigen Turniers war Petrus dem Organisator, Reto Gaudenzi, noch einmal sichtlich gut gesinnt, denn die Sonne schien am Finaltag erneut ununterbrochen. Dadurch war auch die Schneebeschaffenheit absolut perfekt; ein schnelles und packendes Polospiel begeisterte die 7’000 Zuschauer des Finaltages. Die Zuschauer feuerten ihre Teams an, nippten an Perrier-Jouët und genossen die gelöste Atmosphäre während die Maserati Limousinen Gäste und Spieler auf den gefrorenen See fuhren.